Incantations: Erik Straker: BOOK REVIEW – Reviewing Nerds!!! Angela and Lillian Tremblay return to Summerhaven, New Hampshire after sixteen long years away. The sisters are forced to face old small town secrets, as well as forgotten childhood memories that float just beneath the surface of consciousness. One winter’s day, Angela comes home to find her dear, sweet Lillian dead in the basement. The police are content her hanging is a suicide and refuse to pursue other possibilities. But the town’s residents know the gruesome facts about the house. It was once the dwelling of the Summerhaven Witch, a woman known for killing children and bathing in their blood. A tortured Angela meets a local psychic who promises to help her discover the identity of Lil’s murderer. Now Angela must decide if she is willing to risk it all and contact the spirits for answers. When a deceased teenage girl appears and connects Angela’s past to her present, the truth threatens to push Angela from the cliffs of sanity. Will the house’s dark secrets remain buried in the shadows forever, or will the dead come forth to exhume Angela’s memories when she uses the Ouija board and speaks her incantations? Secrets can scar. Memories can kill. 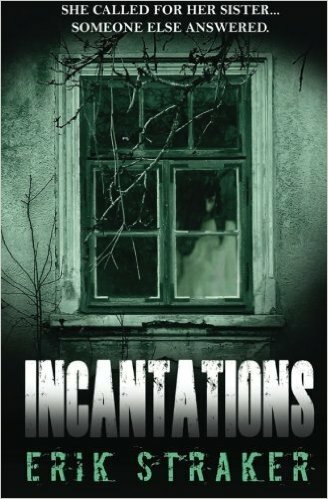 Incantations is a surreal psychological tale that examines the tragedy of suicide, death, and sinister family secrets. This is the debut horror novel by author Erik Straker. One of only a handful of paranormal new releases by him this year. A perfect addition for your horror library, featuring supernatural creatures and supernatural origins. Also perfect if you love haunted houses and ghost novels. DESCRIPTION IN ONE LINE: Stay away from the basement. Title: To be really honest, first time I read the word incantations I had to look it up in my dictionary (Yes, I still have one of those). I was intrigued with the title and it made me start the book quicker that I usually do. Cover: The cover is a strong representation of the story as it creates the spooky effect the writer is attempting to create. Characters: Angela: The character of Angela is a strong representation of an independent woman who doesn’t shy away from responsibilities, hard work and for that matter witches. She is determined to do everything it takes to solve the mystery of the basement of their family home. Review: The prologue is so scary that it gives you goosebumps and still urges to keep going page after page. The author with his debut horror novel shows promising prospects in the genre and can spin the story in any direction that he wants. The story is about a haunted property with a witch and a history that goes way beyond time. The story is written in above average English and makes for an easy read. Along with the scary elements the story connects with the readers on an emotional level as well. Mr Straker has done an excellent job with the story line, characters and the haunted house. The book is written in a blog style which got me confused till the end as the book started as blog, but then it had parts and chapters within. Angela’s journey at 129 Walsh is full of adventure and horror as expected from a book with supernatural elements. Appreciation: Reading the story at bedtime is both fun and scare-fest as it has unexpected twists and revelations. It can be easily finished in one sitting which is one of the major advantages for me. Let Downs: The bifurcation of book’s content in blog, parts and chapters is a bit confusing. Surprise Factor: The revelations towards the end were highly interest grabbing. Final Verdict: Angela’s story makes for an page turner read with multiple goosebumps along the way. Would I be reading more from Erik Straker: Mr Straker is a promising writer in the genre of horror and I would definitely take a plunge in his other works. Keep watching this space for an exclusive interview of Erik Straker.